This Moldavite is guaranteed to be from the Moldau Valley in Czechoslovakia. Formed over 14 million years ago, Moldavite is the only gem quality stone of extra-terrestrial origin. A beautiful, translucent green possessing the properties of all other tektites in addition to its own refined energies. "Moldavite holds immense potential, for direct interdimensional accessing of higher dimensional galactic energies, to draw into the earth plane those thought patterns and light vibrations which are optimal." Melody, Love is in the Earth. Individually and consciously handmade with love at Kacha Stones. 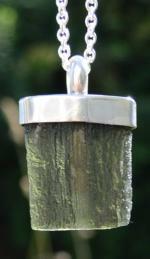 A large (40 x 18 x 10mm) and beautiful Moldavite in Sterling Silver. Moldavite is one of the rarest materials on earth and only the one of truly extraterrestrial origin! Created when a huge meteorite hit central Europe over 14 million years ago. Guaranteed genuine Czech Moldavite. 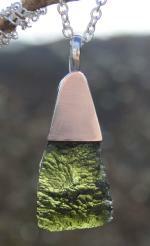 A large (30 x 25 x 7mm) and beautiful Moldavite in Sterling Silver. This exceptional piece curves aesthetically and uniquely.